If a government ratifies investment treaties and provides foreigners with access to investor-state arbitration, they will receive additional foreign investment. This has been the premise of investment law for over 50 years. Is it true? Two decades of studies testing this premise have been inconclusive (as Bonnitcha, Poulsen, and Waibel summarize). Since statistics on foreign investment are notoriously unreliable, they are unlikely to provide a clear answer anytime soon. We can, however, answer a slightly different question: when officials drafted investment treaties and arbitration, did they expect them to facilitate more investment? The answer that emerges from internal discussions among officials in the UK and the US is clear: no. [I]nsofar as they protect existing investment, they are welcome, insofar as they stimulate new investment, they are unwelcome. The balance of our interests determines our attitude to each project. In the present case [the ICSID Convention] our view has been that the balance works to our advantage since we do not expect the existence of the Centre to give any major stimulus to new investment at a rate in the short term (Letter from W. S. Ryrie to J. M. Stevens, January 1967). Similarly, the American government began exploring whether or not to initiate a bilateral investment treaty (BIT) program in the late 1970s, when the US government’s policy was investment neutrality—equal inflows and outflows of investment. American officials went out of their way to say that the treaties would not promote investment, because they feared labor unions would oppose a government that promoted outflows of investment (Vandevelde p. 162). American officials believed that BITs “would not constitute a departure from the investment neutrality we seek” (Memo from Richard T. McCormack to Mr Wallis, October 1982] from Herbert J. Hansell and Julius L. Katz to Mr Cooper, August 1977). “No specific actions are required to promote investment,” they noted, and all treaty provisions are “directed at investment protection or dispute settlement” (Memo is stressed at home while the ‘promotion’ aspect is stressed with the potential treaty partner” (Memo from Stephen Bond to the Files, July 1977). Promotion was emphasized to certain audiences, but not because there was evidence of it. 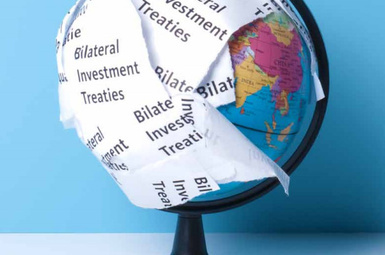 The impact of investment treaties has long been assumed rather than assessed. While in trade negotiations, governments often produce impact studies that galvanize legislative debate and wider public discussion, impact assessments were usually absent from investment treaty negotiations. For governments seeking to attract investment, treaties and arbitration were presented using a logic of consequences: give foreign investors additional rights and you will receive additional investment. But what if there is no additional investment? What if governments approached investment law using a logic of appropriateness—in which laws are followed because they are seen as natural, right, and legitimate, not because of an external reward? What rights would governments give foreign investors then? This is not a speculative question: it is exactly what governments did in Article 1 Protocol 1 of the European Convention of Human Rights (ECHR). In fact, the right to property in the ECHR and the first BITs were drafted in the same years, by the same conservative European governments. Yet they are markedly different. Article 1 Protocol 1 was built to balance private property rights with the public interest, and refining this balance in the crucible of complex, controversial cases has helped define the European Court of Human Rights (Article 1 Protocol 1 is the second most litigated ECHR provision). Governments do not uphold the ECHR right to property because they hope to receive additional investment by doing so. They uphold this right because, by and large, it seems appropriate. Would investment law have a more ECHR-like balance without the premise of additional investment? Taylor St John is a Postdoctoral Research Fellow at PluriCourts, University of Oslo and a Senior Research Associate at the Global Economic Governance Programme, University of Oxford. She is author of The Rise of Investor-State Arbitration: Politics, Law, and Unintended Consequences. The archival documents cited in this post are available in the Qualitative Data Repository.